This series continues to be a wild one. After the San Jose Sharks dominated game one at home, the Vegas Golden Knights have stormed back to win the next two games. 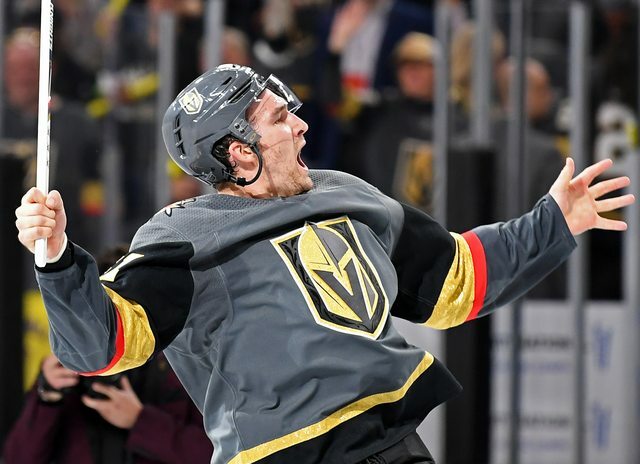 Winning game three by a 6-3 margin, the Golden Knights were able to take a 2-1 series lead, with game four slated for Tuesday evening in Vegas. Coming off another high-action, high-energy game, here are game three’s Game Changers. Once again, Jones was back to letting soft goals in and he wasted no time doing it. Mark Stone was able to get his team out to a 1-0 lead on the very first shot of the game, a backhand just over his glove, just 16 seconds into the game. Granted, Logan Couture made a bad read trying to steal the pass to Stone. He missed it, effectively taking himself out of the play and leaving Stone open. Despite the good look for Stone, it was a save Jones needs to make. Instead, Stone lit the lamp, digging an immediate hole for the opposition. Surprisingly, the Sharks stuck with Jones following the soft goal, with his game two performance fresh in their minds. With help from defensive miscues, Jones allowed a goal in the first minute of each period, sapping any momentum his team may have had out of the tunnel. He would go on to finish the game with 34 saves on 40 shots, not good enough for a team equipped to win a cup, at every other position. It can’t be stressed enough, goaltending continues to kill this talented team’s chances of winning anything significant. It’s no secret that the acquisition of Stone was huge for the Golden Knights. Heading into the trade deadline, they were one of the worst teams in the league, at the time. Once he came in, the team reeled off a ton of wins, going 10-1-0 in the first 11 games of the Stone Age. He was the biggest asset advertised as available at the deadline and General Manager George McPhee made a great move swooping in and picking up an impact player of Stone’s caliber. 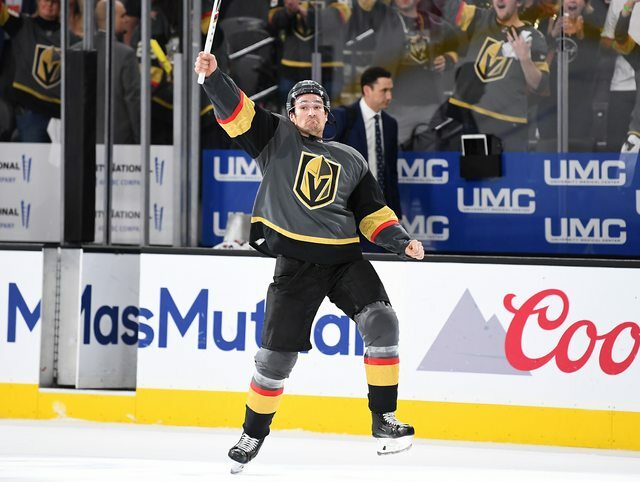 Game three may have been his best thus far with the Golden Knights, as he opened the scoring and eventually racked up a hat trick, the first of his career, with an assist for good measure. Upon his arrival, Stone has skated exclusively on a line with Max Pacioretty and Paul Stastny, operating as the second line on the depth chart, giving the Golden Knights more of a Line 1a and Line 1b scenario. All three men on the Stone line were wearing different emblems on their chests last season and in Stastny’s case, two different emblems. The team continues to reap the benefits of the free agent signing of Stastny and the trades for (offseason) Pacioretty and (deadline) Stone. Stastny had a big game as well, uncharacteristically scoring two goals on the night, as more of a pass-first center. All six goals scored by the Golden Knights were driven by the New Guy Line, with two of those coming on the power play, a previously weak area for the team. By the time the final horn sounded, the trio compiled a total of 12 points (Stastny-5, Stone-5, Pacioretty-2). They are a force to be reckoned with. Too much of these first three games have been predicated around the two teams’ hatred for one another. Post-whistle scrums have become common on both ends of the ice. 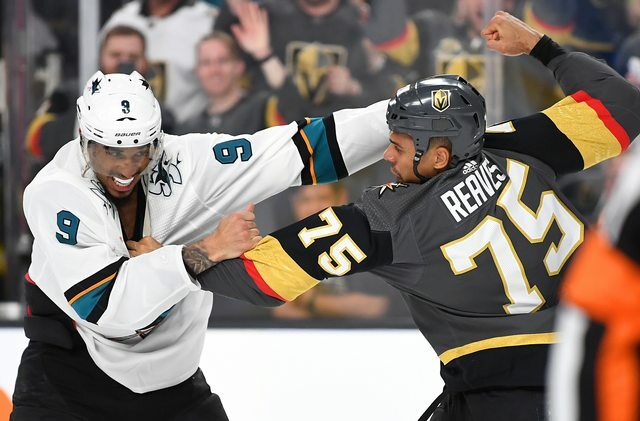 Golden Knights enforcer, Ryan Reaves continues to take runs at Sharks players, any chance he gets. Evander Kane also hasn’t been shying away from the physical and his recklessness led to the second goal of the game for the Golden Knights. Pacioretty sniped one in, a short five seconds into his double-minor for high-sticking William Carrier. With just over two minutes left in the game, Reaves and Kane aggressively hacked at one another until they'd eventually fight, with the game already in hand. Neither team has played a clean, disciplined game in this series, and this is an area that may end up deciding the series. There weren’t as many penalties as assessed in the previous game, but both teams need to learn how to play physically, while staying out of the box, with so much firepower on both sides. Each team is allotted one challenge per game, by the NHL rules, if the referees happen to miss a call (if you could ever imagine that happening...). On the season, Gerard Gallant challenged anything close, going 6-for-15 on total challenges. In this game, Gallant chose to challenge a fairly clear Kevin Lebanc goal in the first period. There wasn’t much to challenge, yet Gallant wanted to and was granted the opportunity to challenge for goaltender interference. His track record with interference challenges is not good, getting just two calls on 10 challenges this season. With the Sharks cutting the lead to one goal, this challenge served more as a momentum-stopper, rather than a legitimate challenge. With no obvious fix in mind, these kinds of challenges and the overuse of them may be something the NHL is just stuck dealing with, as an unintended consequence of attempting to get the calls right. Following game one, it seemed as if the Sharks were going to run away with the series. Jones was sharp in the first game and fooled everyone into thinking he’d live up to his career playoff numbers rather than his season-long sample of sub-par goalie play. While he could potentially bounce back and be good enough to get the Sharks to a conference final again, it seems unlikely. In the remaining games, the Golden Knights will be sure to pressure Jones early and often. His tendency to allow quick goals to start periods does his team no favors and he has yet to make a game-saving stop in this series. Things need to change fast for the Sharks because if they allow the Golden Knights to take a two-game lead on Tuesday, they’re as good as gone. Although it’s a big game, Peter DeBoer may be wise to deploy Aaron Dell in Jones’ place, an easy way to shake things up, without much of a drop-off in productivity. Either way, the Golden Knights are red-hot and look to take a commanding 3-1 lead with another home win in game 4 on Tuesday evening. Be sure to follow me on the Twitter (@VGK_Buzz) for Golden Knights news, analysis, and updates.